The purpose of the article is to implement a Behavior Driver Development (BDD) infrastructure for Android applications with the JBehave open source BDD tool and Robotium open source Android testing software. We will go through complete architectural understandings and try to set-up the framework. Behavior Driven Development is easiest way to ensure that all stakeholders are on same page. The software tester is sure about testing the application designed exactly as expected by the product owner, the business analyst and developer. To create a BDD architecture to test Android applications, we will use Motile as AUT(application under test) for this purpose. Before moving on, it is necessary to have a quick presentation of the tools that will be associated to build BDD framework. Robotium is an open source test automation framework for Android native and hybrid applications. One can write functional, system and acceptance test scenarios, spanning multiple Android activities. It can be used both for testing applications where the source code is available and applications where only the apk file is available. The TestRunner is an InstrumentationTestRunner for Robotium Remote Control. Because the actual AUT-specific test code is on the remote Controller and NOT in the TestRunner, the TestRunner receives its remote command and control data and reports its success, failure, and results data through the Messenger service. JUnit is an open source unit testing framework for the Java programming language. Using JUnit, we will put asserts and annotations to design our test project around Robotium. JBehave is Behavior Driver Development framework that helps to implement stories based on test scenarios easily understandable by the product owner, the business analysts, testers and software developers. We can easily use the “Given”, “When”, “Then” and “And” keywords to define the scenarios. Maven can be used to manage project builds and reporting using POM (Project Object Model). Motile is a sample Android application designed to use known Android SDK controls. 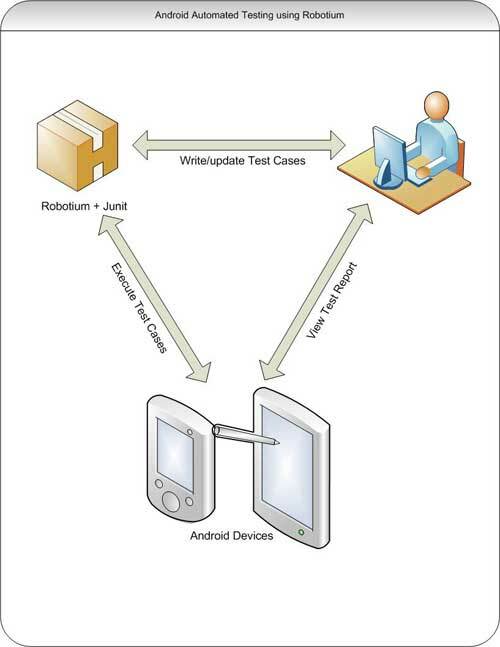 This simple application can be uses to write test cases around Robotium. We use the Robotium API to write test cases bundled with JUnit annotations and assertions. They will instrument the Android application (Motile) to simulate the user actions explained in the test cases, to verify assertions and to come up with a report. An example of this implementation can be found as testMotile. To implement BDD around the above architecture we will use JBehave at its core. However, before moving on it is necessary to describe the core architecture. This will help to understand the environmental limitations and find the way out. Android apps are built using Java but run on the DVM (Davlik Virtual Machine) which is similar to the JVM (Java Virtual Machine) but for Android. Robotium instruments the AUT (Application Under Test) and runs it in the DVM. JBehave works on the JVM and converts the text based user stories into JUnit based test cases. Thus it is not possible to run the JBehave based test cases directly with Robotium. 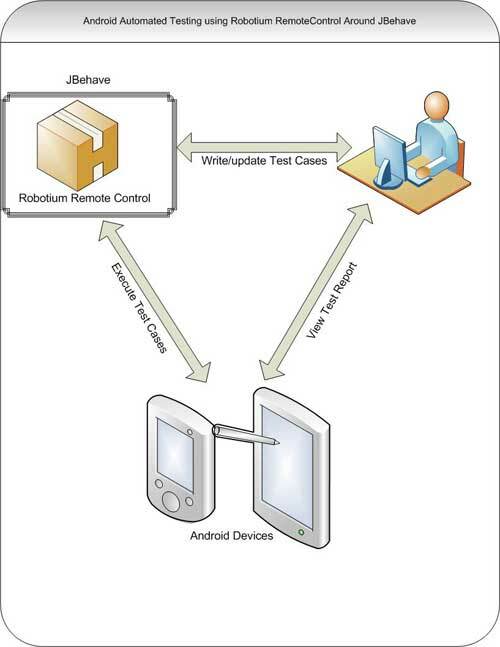 To implement BDD for Android apps, we will use Robotium Remote Control that is built to run Robotium on the JVM. We will write text-based stories containing steps to cover all test case scenarios and map steps to Java based test classes using JBehave stories configurations. The next step is to pass these test cases to Robotium Remote Controler that will take the responsibility to launch the AUT, execute test cases and come up with the test result report. To keep the things simple, we will implement a simple story, which will cover loading of main screen and verify the activity name of the Motile app on Android Phone. Follow the Robotium installation instructions and skip the third part “Verify (Install if needed) Apache Ant:” as we will run our project using maven. Put the above files into the remote control project, collect all remote control jars (this is explained in the above installation link). Create the maven POM.xml file with all the necessary info and run the following command from command line. Don’t forget to connect the Android device with your computer through the USB Cable. This command will run the project by downloading the necessary jars, installing apks on device, launch Motile, execute the test cases and come up with a report. Hi.. Naveed, Thanks for your article. It is great. I installed Robotium RC and jBehave, and tested both of them. They are working fine. But the last bit is unclear for me. Could you explain more about how to join them? If you have any sample projects, it would be perfect. Looking forward to hearing.. Thanks in advance.